FREEZER: Freeze in 2 9" x 9" pans, saving one for another meal. In a large bowl, combine milk and pie filling. Add oranges, pineapple and nuts. Gently fold in whipped cream. Spread in a 13-in. x 9-in. pan - or 2 9-in x 9-in pans. Cover and freeze. Remove from the freezer 15 minutes before serving. 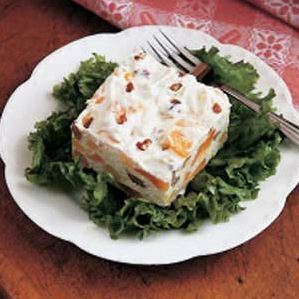 Cut into squares; serve on lettuce-lined plates if desired. Yield: 12-15 servings.